Don't be put off by the name or jump to any conclusions about Villa Nova Junction, even if the name seems more appropriate to a bed-wetting, navel-gazing American alt-rock band. If the Rolling Stones or Mott the Hoople altered course and veered through the early punk movement (with less anger and more melody), they might have sounded like Villa Nova Junction. Fronted by a guy who sounds like an adolescent Mick and backed by a clutter free crisp mix, Villa Nova Junction is all raucous and swaggering rock and roll. You might even hear some snotty and obnoxious attitude from likes of MC5 or the (early) New York Dolls. Villa Nova Junction is all unexpected: brash presence with likeable, often danceable, tunes that clip along with anxious enthusiasm thanks to compact melodic arrangements. Packed within songs like Critical, Sunkissed, Whore, or 24/7 Headache is enough jalapeno and cohones punk-pop heat to make your iPod sweat. As brisk as the walk may be through this album, towards the end things begin to smooth out with a predictability that nears dullness. I soon began to wonder if VNJ was not caving into more modern rehashes of 80's sleaze rock. 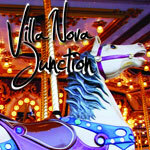 Yet thanks to the strength of the whole, Villa Nova Junction deserves repeated spins for maximum enjoyment. Sweden's Villa Nova Junction imagines the Stones steeped in a vat of early punk and then rinsed with the melodic pop sense of 80's rock. The tunes are clever, catchy and raucous, promising a rocking good time.